Deutsche Bank Wealth Management is launching a new unit aimed at ultra high net worth investors and family office clients, the company says. The Institutional Wealth Partners group is meant to harness the firm’s resources to offer wealthy clients various “institutional quality” services, such as tailored lending, investing and corporate finance, according to a press release form Deutsche Bank. “Continuing to strengthen the bridge between Wealth Management and other offerings within Deutsche Bank will ensure we are creating tailored and comprehensive solutions for clients,” Patrick Campion, head of Deutsche Bank Wealth Management in the Americas, says in the press release. The company has named Todd Stevens as global head of the new unit and Dan Kaiser as regional head for the Americas, Deutsche Bank says. In addition, Deutsche Bank hired Alan Brody to serve as head of IWP Americas’ investments and trading, according to the press release. Brody was formerly part of JPMorgan’s global investment opportunities unit, Deutsche Bank says. 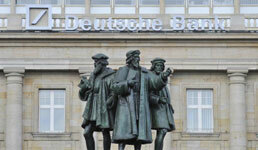 “As family offices and ultra-high-net-worth clients are seeking greater involvement and opportunities in how their capital is deployed, we believe our IWP team provides focused and tailored solutions to their unique needs through providing global access into Deutsche Bank’s CIB capabilities,” Kaiser says in the press release. The bank’s wealth management unit oversaw around $318 billion for clients worldwide as of the end of February, according to the press release. The Frankfurt-based bank has been expanding its U.S. wealth management operations in recent months. In October, the firm poached two executives from Wells Fargo and Bank of America’s U.S. Trust.